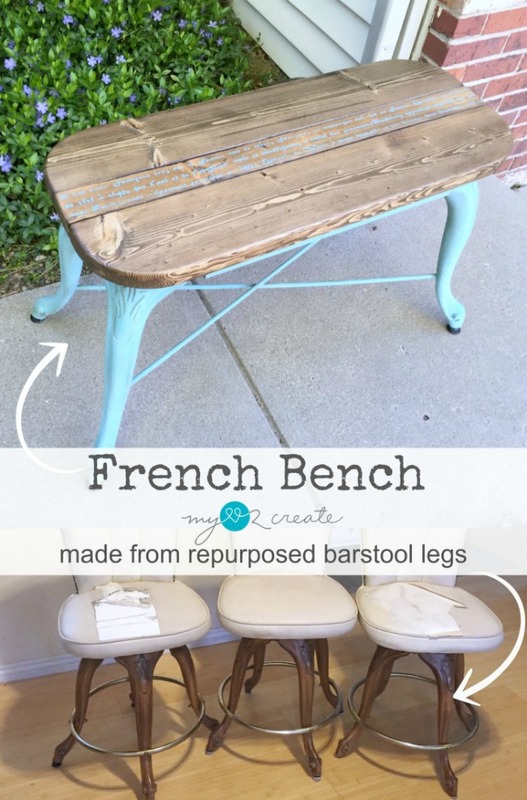 Today I am sharing a French Bench from Repurposed Barstool legs! I really enjoyed doing this project and I love how it turned out! This was one of my contributor posts at My Repurposed Life last spring...so don't think it is all green and pretty here...trust me, we are still buried in snow and cold. My good friend was going to throw these barstools to the curb for our city's spring clean up, but decided to call and ask me if I wanted them first. Smart woman! I am so glad she did, because of course I wanted them! I started by taking off the seat, and removing the swivel thing (which is great to have in my stash!) Then I removed the metal ring around the legs. I decided to separate the legs since they really could only be used as a chair if I left them together. I unscrewed the screws on the top to remove the thicker circle, but it was glued super tight... sooooo, I decided to leave it on. That way I didn't damage the wood. 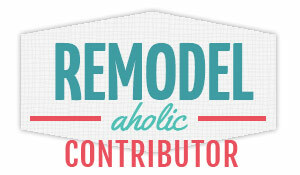 I marked the center and got out my Ryobi Circular Saw to cut them in half. Since my blade, at it's longest setting, didn't cut all the way through I just used my Ryobi Jig Saw to finish it off! Done! I grabbed some of the scrap wood left over from my X Arbor with Bench to make a bench top. I set the top boards down (2 2x6's and 1 2x3) then positioned the legs so I could measure for the supports boards. I marked and cut two 2x2's for the side supports (left over from my X planters) and one 2x4 for the middle support. 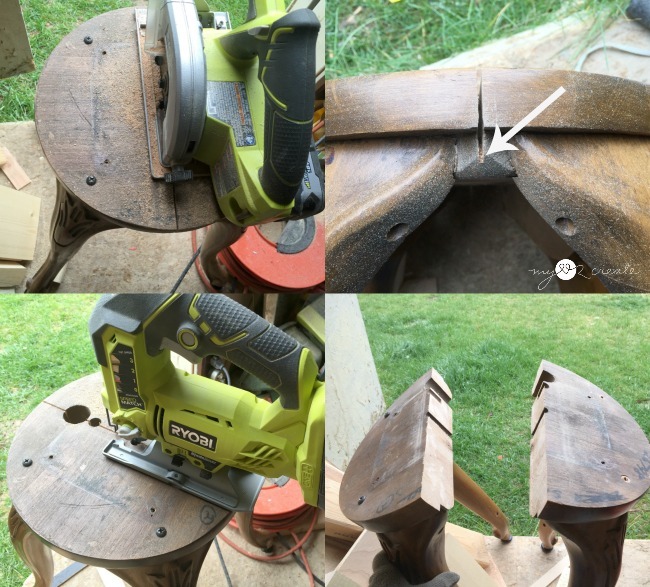 I got out my Kreg K5 Pocket-Hole Jig to drill pocket holes and then attached the two leg sets together. I love to use gorilla wood glue and clamp everything tight to drill in my pocket hole screws. After I was done attaching the supports I was left with this. Now to build the top of the bench. I drilled 2 1/2'' pocket holes into my top boards and attached them together. I decided to make the ends of the bench top rounded so I just used a bowl to mark the corners and cut them out with my Ryobi Jig Saw . 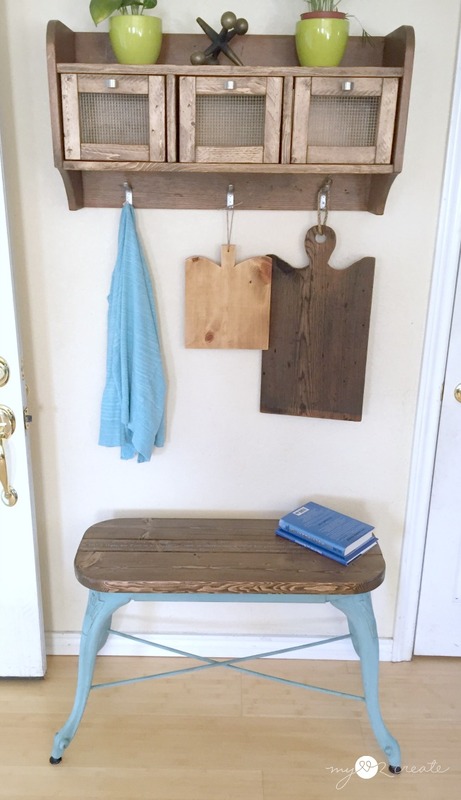 I sanded and stained the bench top (with a mix I made for my Shoe Cubby Dresser) and also some dowels that I decided to add at the last minute. 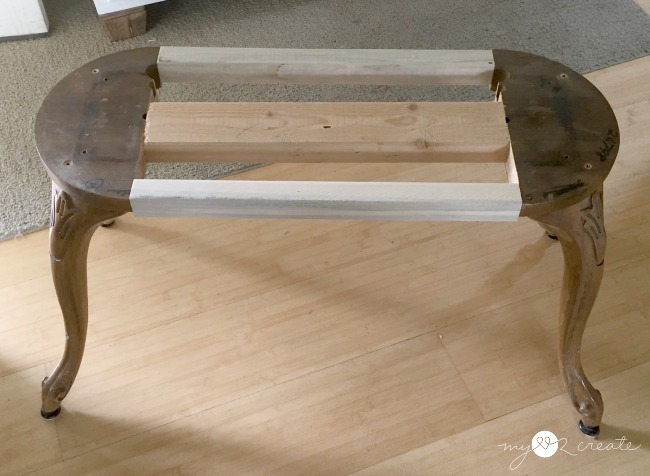 The legs had holes in them from the metal bar, and I used a drill bit a little bigger than my dowels to drill into the hole and make them the right angle for adding dowel across the length of the bench. 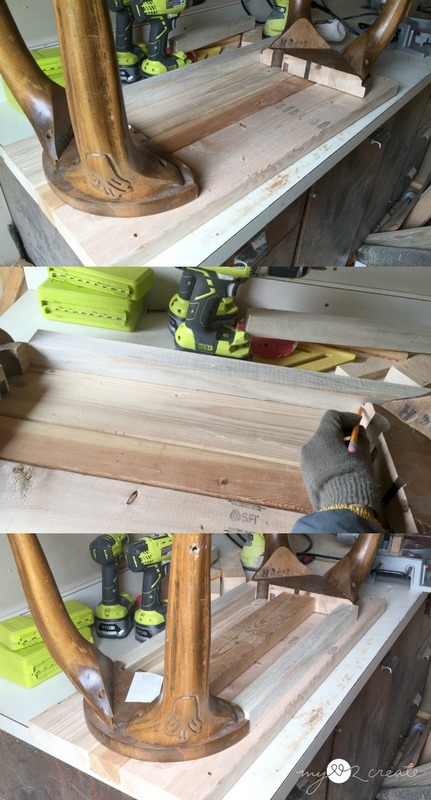 Above, in the bottom left photo you can see on one set of legs I had to drill higher so the dowels could cross in the center. 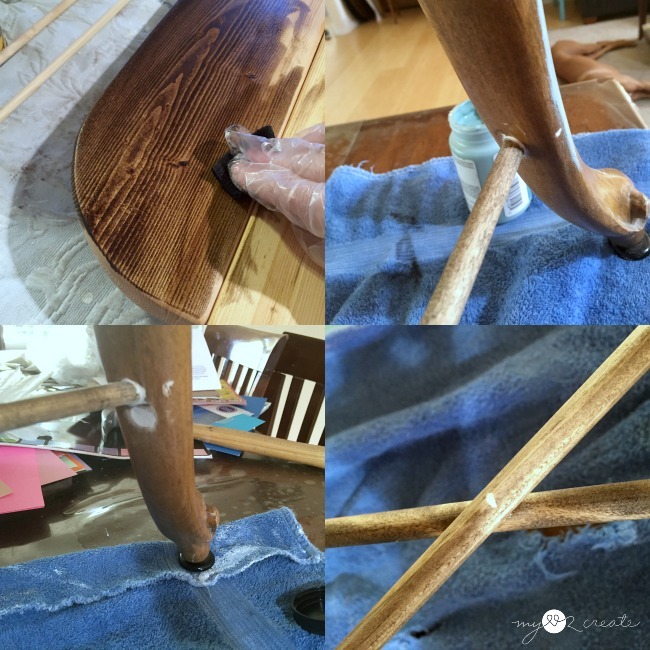 I used wood glue in the holes added some nails through the legs to secure them. I also nailed them in the center where they cross. 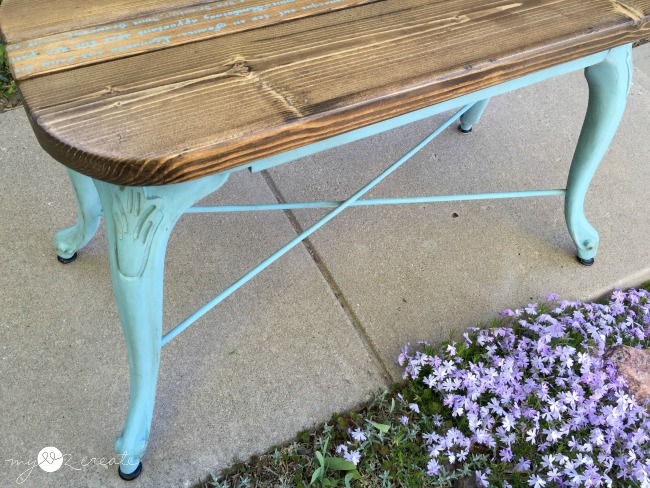 I used Folk art chalk paint that I got at a blogging conference. I had been wanting to try it for a while and this was the perfect project. My daughter helped pick the color. :) I really liked the paint, it went on great and sanded smooth. I used a dark chocolate wax to show off my distressing and the curves. 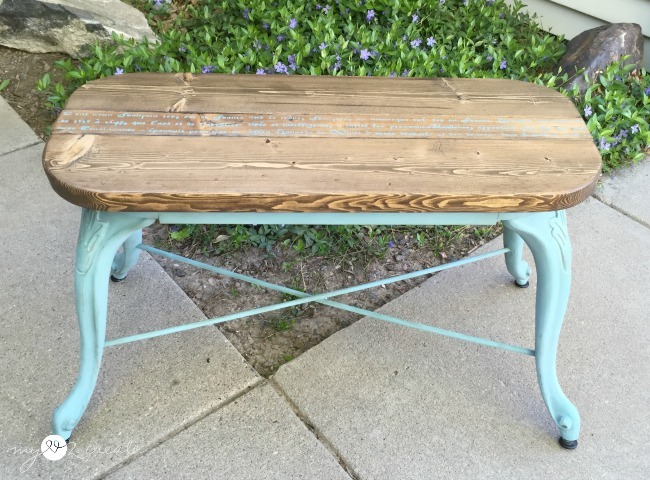 I thought the legs gave the piece a french look so I pulled out my stencils. 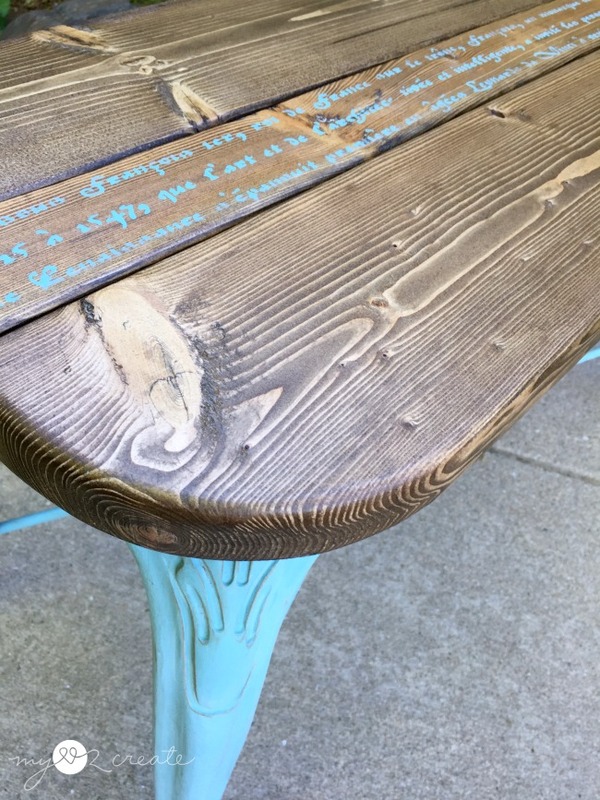 Since I used my other french stencils on my French Inspired Piano Bench Makeover, I decided to try the french script stencil. I ended up just doing the center board. 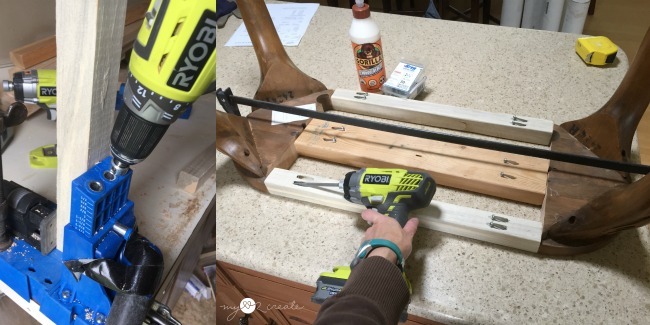 I attached the legs using my Kreg 2'' screws to drill through the rails, or supports, right into the bench top. The nice thing about these screws is that they are self tapping, meaning they don't require pre-drilling. 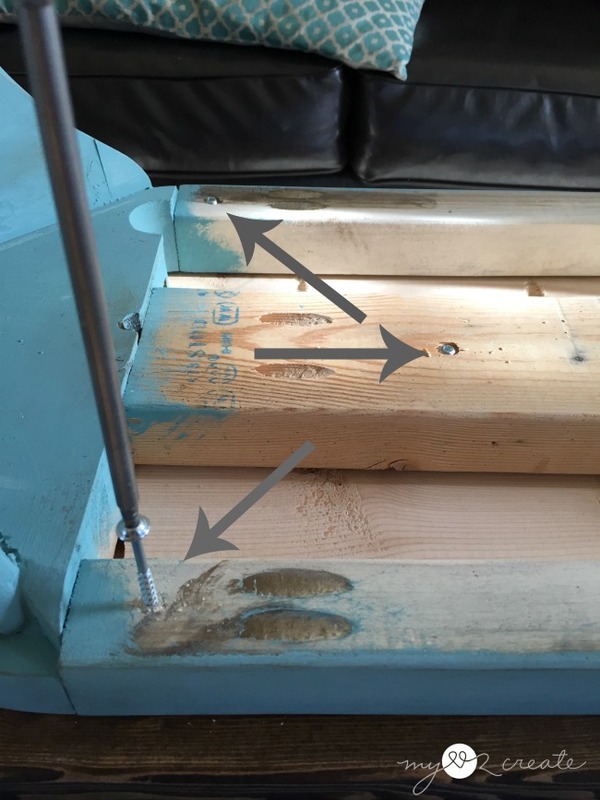 I normally only use them for pocket holes, but when you are out of regular wood screws these are a fast and easy replacement! I did seal the top with three coats of poly, sanding between coats 1 and 2 with 400 grit sand paper for a nice smooth finish. This is the final bench! It has it's own style and personality, and my kids were so funny turing to figure out what it might say! The cross bars are both decorative and supportive, helping to stabilize the legs. 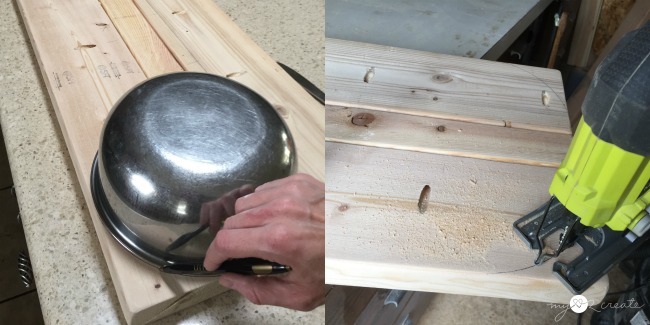 I think if I could redo it I would have used thicker dowels, but I was using what I had so it works! This piece would be perfect for a little girls room at the end of the bed. Now I just need to figure out what to do with the other two bar stool legs! Any ideas? 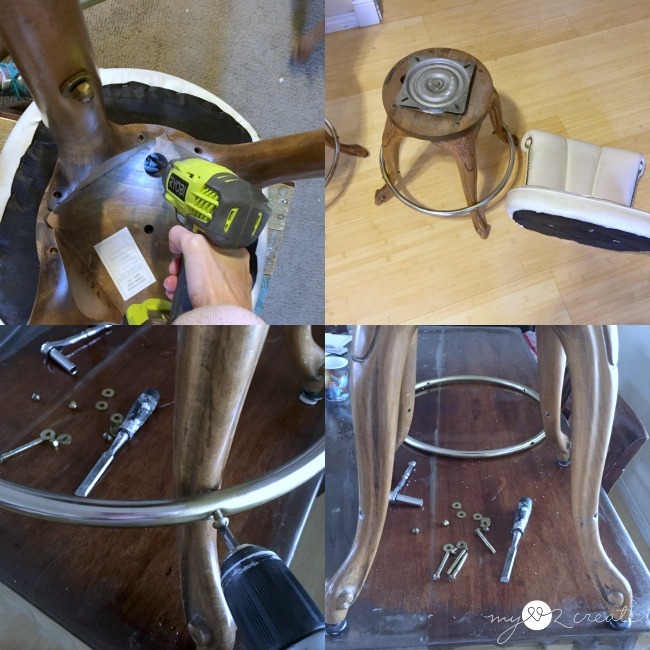 What wonderful looking barstool legs. 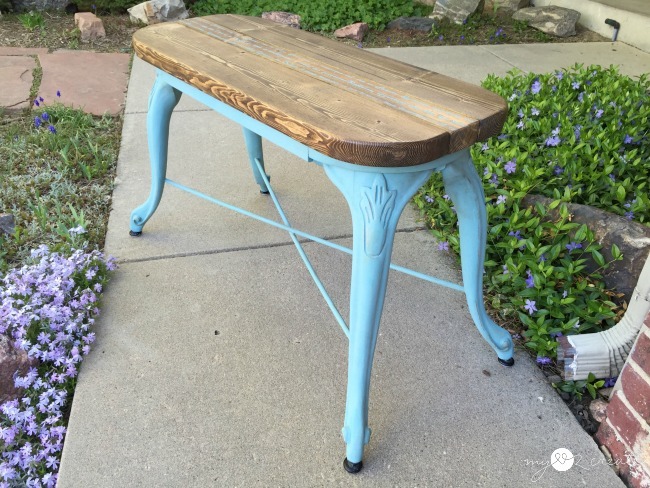 Great looking bench and what a wonderful idea using the barstool legs. Two barstools left, maybe make 2 more benches. I love seeing all the wonderful projects you come up with. Little round end tables? 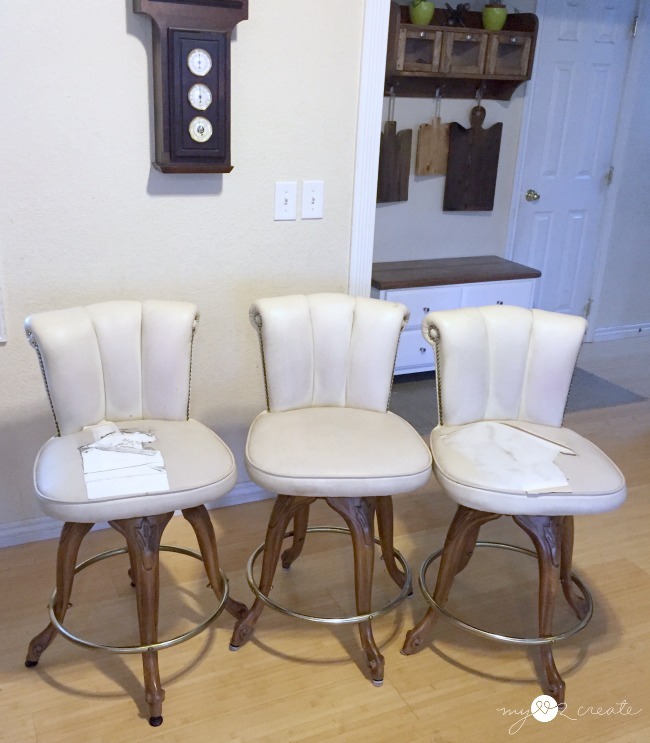 Or even keep them barstools but with a flat wooden seat instead of the upholstered ones. Oh wow that is really cool. Love the finish and that stencil detail!!! Lots of work but a wonderful transformation! 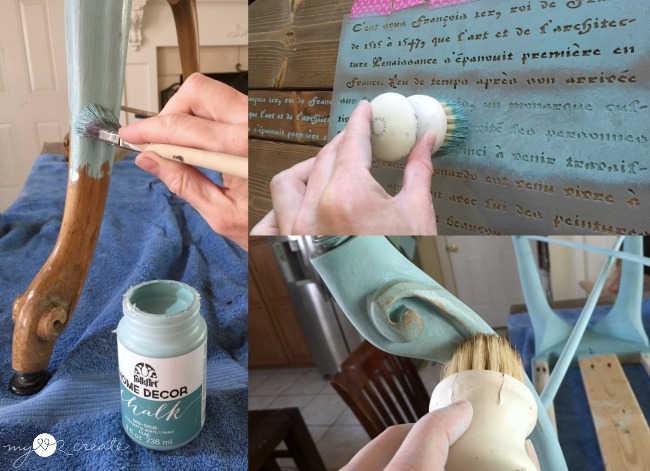 Love that paint and color....I am on my second bottle of it! 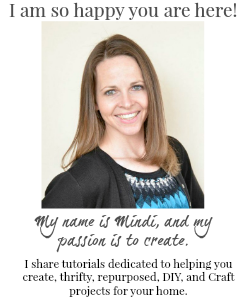 Mindi, I guess the legs would be too short for a small table. Maybe a plant stand would work leaving the 4 legs as is. I am imagining a nice wooden circle top with glass over that to protect it from water. Color? I would lean to a bright color myself. Just an idea. Sylvia D.
Oh gosh Mindi, I love the bench! I would not have thought to do that with the barstool legs. Thanks for sharing with SYC.